Yo, it’s the Justice League. While this guide will mostly focus on more modern Justice League comics (from 1997 to present day), if you want to get some good older origins going, Justice League: Year One is as good a place as any to start. The majority of modern comic book readers will want to start with Grant Morrison’s run on JLA. Starting around 1997, Morrison took a post-Death of Superman, post-Knightfall, post-Parallax DC Universe, and returned the world’s finest heroes to the Justice League. 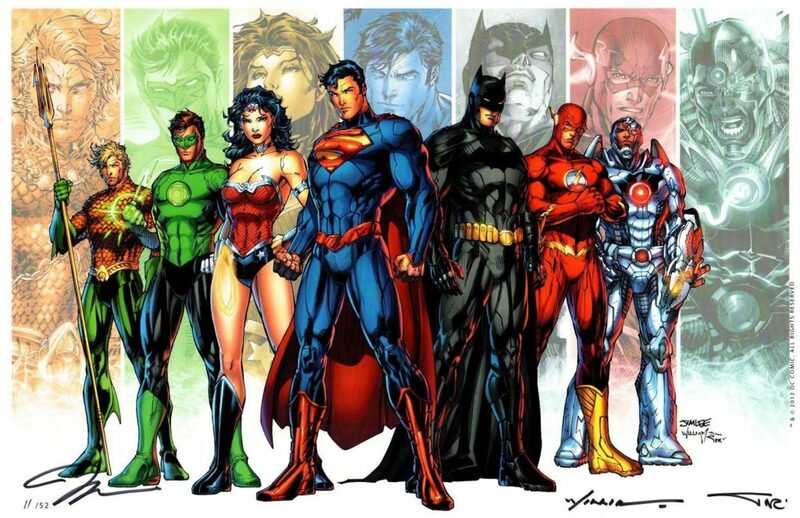 The core lineup of Superman, Batman, Wonder Woman, Aquaman, Flash, Green Lantern, and Martian Manhunter has become the Justice League standard since this time, particularly solidified in DC’s Animated Justice League: Unlimited. Note that the above four JLA collections will take you through JLA #1 to #41. This actually completes Morrison’s run (following World War III). In order to collect Tower of Babel , one of the defining Batman stories of the early 2000’s, you could conceivably turn to JLA Vol. 4 . Tower of Babel itself, while frequently referenced and turned into a DC Animated movie, has been strangely out of print. This time period will also take you through the Grant Morrison and Frank Quitely JLA: Earth 2 graphic novel. You’ll also note that I included DC One Million above. This takes place after JLA #23, and is another recommended Grant Morrison event from this era. 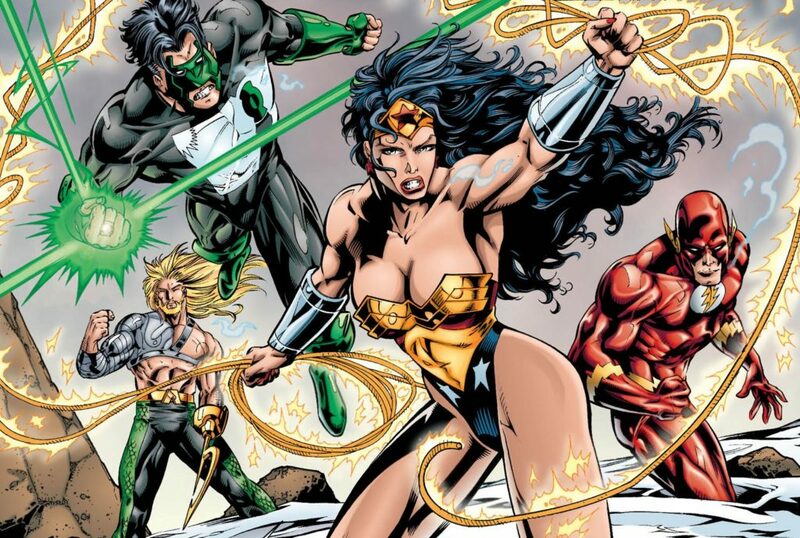 The JLA: One Million collection is a more affordable approach to get the basics of the event. If you’ve looked into essential DC Universe stories from the 2000’s, you’re likely at least a little familiar with Identity Crisis. The controversial mystery from Brad Meltzer has major ramifications on both the DCU and the Justice League. For all intents and purposes, it’s a Justice League story. Following the events of Infinite Crisis and 52, DC relaunched Justice League of America with a new number one issue, and Identity Crisis money-maker Bred Meltzer. In 2011 DC Comics rebooted their entire comic book line into the New 52. This means a relaunch and brand new origin for the Justice League, with Geoff Johns and Jim Lee on creative duties. If you want to see every DC Comic from this era, you can check out the full Comic Book Herald New 52 reading order! Hey we made it 12 issues without a crossover! Throne of Atlantis crosses over with another Johns written title, Aquaman. Following Throne of Atlantis, Justice League of America launches a fresh series in the New 52. Note that although the above collection includes six issues, the sixth issue of Justice League of America will work best as a Trinity War tie-in. Justice League: Injustice League – This collection covers Justice League #30 to #39, which takes you through the Amazo Virus story arc as well. You can find the context for Justice League in DC Rebirth as part of Comic Book Herald’s complete DC Rebirth reading order. Following the events of Dark Nights: Metal, the Justice League lineup of comics rebranded with new core rosters under the “New Justice” umbrella. The “No Justice” mini kicked things off, and leads to three core titles: Justice League, Justice League Dark, and Justice League Odyssey. 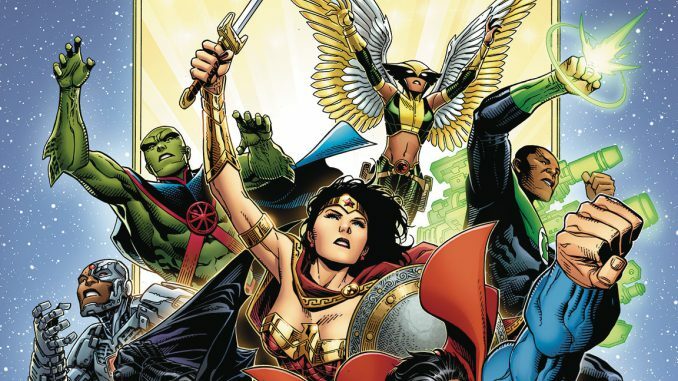 The Scott Snyder written era of Justice League begins, with artists including Jim Cheung and Jorge Jimenez. You can find a checklist and reading order for this crossover with Comic Book Herald’s Drowned Earth guide. You can find a checklist and reading order for this crossover with Comic Book Herald’s Witching Hour guide. You do not even have the decency to credit the site where you took the image from after googling it? I mean, you even kept the original dimension (1500X1010 px). How shameless are you? I mean, it’s not like the site owner has any copyright on it or something but you are so shameless that you couldn’t even buy a digital copy of the book and just crop it yourself? I posted this comment before, but you deleted. Why are you afraid to even link back? It’s not like you are being asked for money! I was wondering what the best Justice League are, where Superman is the featured character (in the sense that Batman is the featured character for Tower of Babel)? I don’t see Forever Evil #3 in the reading order… where does this fit in? PS love this guide. Fantastic Guide! I’ve been looking for something like this and it’s perfect. Only question.. Wouldn’t the Darkseid War ‘Power of the Gods” go in between Vol.1 and 2? Anyway thanks for this! Yes, absolutely! I must have only updated on the full New 52 guide. Now updated. Thanks, and glad you’re enjoying! I do not have the individual issues. I am reading the tpb reprints of Justice league, JLA, forever evil, trinity war and Justice league dark of the “new 52”, what order should I read those in? One of the best, most helpful, and simply awesome guides in the Multiverse! What about the Justice League International books fit in? I believe that they started not too far into the New 52 phase? Hi this is a fantastic order, however, I was wondering where and how convergence will fit into this Justice league reading over since i believe it is a Justice League “level” event. Also, I was also wondering if you have or will ever make a full New 52 reading order over all the New 52 Graphic novels or at least the main books/stories/characters? Thank you so much! Would there be anyway for you to create a complete timeline of the entirety of DC’s publication like you have done with Marvel? I know it’s quite a big request but I’d just like to know if that’ll ever happen on here. I’d Love it if you could make at least a New 52 order. Love the work you do by the way! You must spend hours going through comics and deciding what goes where.